When it comes to working together to support the survival and enjoyment of history for students in our schools, why are history teachers, as a group, as good as paralyzed? Whatever the reason, in the national debates over nonfiction reading (history books, anyone?) and nonfiction writing for students in the schools, the voice of history teachers, at least in the wider conversation, has not been clearly heard. Have the bad feelings and fears raised over the ill-fated National History Standards which emerged from UCLA so long ago persisted and contributed to our paralysis in these national discussions? Are we (I used to be one) too sensitive to the feelings of other members of the social studies universe? Are we too afraid that someone will say we have given insufficient space and emphasis to the sociology of the mound people of Ohio or the history and geography of the Hmong people or the psychology of the Apache and the Comanche? Or do we feel guilty, even though it is not completely our fault, that all of the Presidents of the United States have been, (so far), men? I am concerned when the National Assessment of Educational Progress finds that 86% of our high school seniors scored Basic or Below on U.S. History, and I am appalled by stories of students, who, when asked to choose our Allies in World War II on a multiple-choice test, select Germany (both here and in the United Kingdom, I am told). After all, Germany is an ally now, they were probably an ally in World War II, right? So Presentism reaps its harvest of historical ignorance. Of course there is always competition for time to give to subjects in schools. Various groups push their concerns all the time. Business people often argue that students should learn about the stock market at least, if not credit default swaps and the like. Other groups want other things taught. I understand that there is new energy behind the revival of home economics courses for our high school future homemakers. But what my main efforts have been directed towards since 1987 is prevention of the need for remedial nonfiction reading and writing courses in college. My national research has found that most U.S. public high schools do not ask students to write a serious research paper, and I am convinced that, if a study were ever done, it would show that we send the vast majority of our high school graduates off without ever having assigned them a complete history book to read. Students not proficient in nonfiction reading and writing are at risk of not understanding what their professors are talking about, and are, in my view, more likely to drop out of college. For all I know, book reports are as dead in the English departments as they are in History departments. In any case, most college professors express strong disappointment in the degree to which entering students are capable of reading the nonfiction books they are assigned and of writing the term papers that are assigned. A study done by the Chronicle of Higher Education found that 90% of professors judge their students to be “not very well prepared” in reading, doing research, and writing. I cannot fathom why we put off instruction in nonfiction books and term papers until college in so many cases. We start young people at a very early age in Pop Warner football and in Little League baseball, but when it comes to nonfiction reading and writing we seem content to wait until they are 18 or so. For whatever reason, some students have not let our paralysis prevent them either from studying history or from writing serious history papers, and I have proof that they can do good work in history, if asked to do so. When I started The Concord Review in 1987, I hoped that students might send me 4,000-word research papers in history. By now, I have published, in 98 issues, 1,077 history research papers averaging 6,000 words, on a huge variety of topics, by high school students from 46 states and 38 other countries. Lots of high school [and middle school] students are sitting out there, waiting to be inspired by their history teachers [and their peers] to read history books and to prepare their best history research papers, and lots of history teachers are out there, wishing there were a stronger and more optimistic set of arguments coming from a history presence in the national conversation about higher standards for nonfiction reading and writing in our schools. The 2013 Oahu History Bee and Bowl will be held at ‘Iolani School in Honolulu on Saturday, November 9, 2013. This event, along with the Hawaii History Bee and Bowl, is sponsored by History Education Hawaii, the Hawaii council of the National Council for History Education, and the Pacific Learning Consortium. Additional sponsorship partners are welcomed. For all queries please email Executive Director David Madden at director@historybowl.com or via cell phone at (201) 661-3524. The National History Club (NHC) has invited chapter members throughout the country to write an essay of not more than 2,000 words (supplemented with a bibliography and endnotes) conveying how a past leader would address a current relevant issue facing our country or the world. Using examples of how that leader resolved crises during his/her era, students should look to clearly explain how and why that person would be able to effectively manage and improve upon a pressing matter affecting either our nation or the world. These are just a few samples --- feel free to get as creative as possible using unique approaches in selecting both past leaders and issues of importance. All entries must be received by March 15, 2014 and can be emailed to Bob Nasson at rnasson@nationalhistoryclub. org (please type “Lessons of Leadership” in the subject line). Essays will be judged by the NHC Advisory Board. Winners will be announced in the middle of April. Please pass the following information on to any members of NCHE Hawaii or elsewhere with interest in Women's studies, oral histories, or American Indian Literatures, culture or history. Winnebago Women: Songs & Stories. All five DVDs feature women speaking directly to the audience in their own voices and in their own words (in Mountain Wolf Woman’s case, the words are hers, but her granddaughter is the narrator). Lengths range from 15 to 22 minutes. Tribal College: Journal of American Indian Higher Education called these videos “excellent examples of the oral tradition. The stories are told by the women who experienced them rather than as interpretations by others. The National History Bee and Bowl and the US Geography Olympiad are Returning to Hawaii! Welcome to a new year of history and geography quiz competition! The National History Bee and Bowl (NHBB) and US Geography Olympiad (USGO) are excited to announce the start of our competition season with lots of ways for your students to compete. 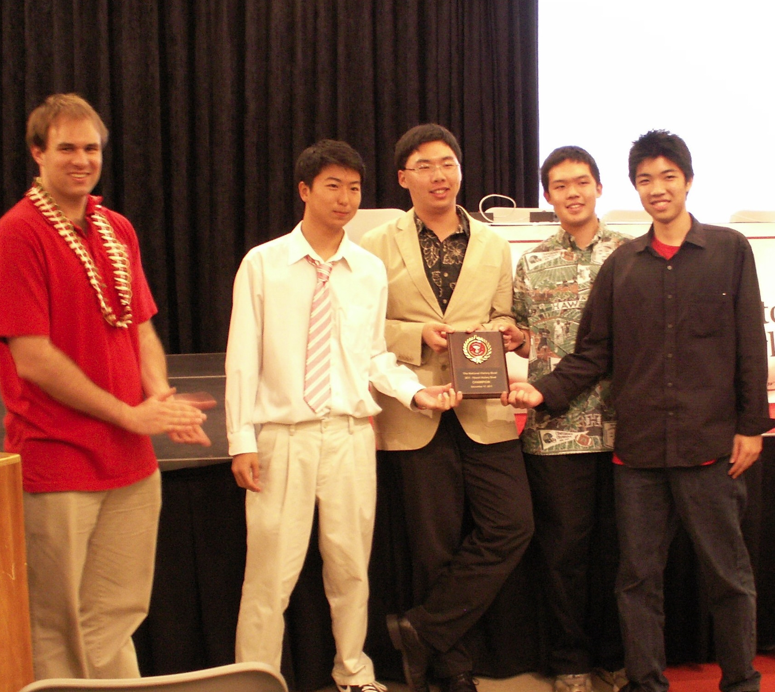 Go to this link for a photo album of the 2012 competitions at Iolani School, Honolulu. As always, registration for our tournaments is done online at www.historybowl.com/registration for high school level History Bowls,www.hs.historybee.com/registration for high school level History Bees, www.historybee.com for the Middle and Elementary School History Bee, and at www.geographyolympiad.com for the USGO National Qualifying Exam. Also, note that for the high school History Bee and USGO, same-day registration is permitted – the online option is provided simply if you need an invoice. History Bowl registration (which is required) remains open until 2 days before each tournament, though earlier registration is always appreciated. using high school level questions there, so unless we get 4 separate elementary and middle school Bowl teams or at least four students in the Bee, students competing here may play against high schoolers in the Junior Varsity division. Also, there is a different version of the USGO exam for each set of questions a tournament runs on. The USGO is certainly open to middle and elementary school students, who compete together with anyone born after July 1, 1998 in the Junior Varsity division of USGO. Junior Varsity for the History Bee and Bowl is, as in the past, defined as 10th grade and younger. For more information, including a few practice quizzes courtesy of our new Sri Lankan host school (! ), please seewww.historybowl.com, www.hs.historybee.com, www.historybee.com, and www.geographyolympiad.com. We’ve also added a new preparation guide at: http://www.historybowl.com/study-guide/ If you have any further questions regarding the high school division, please email NHBB Executive Director David Madden atdirector@historybowl.com. For questions on the Elementary and Middle School Division, please email Elementary and Middle Director Eric Huff at eric@historybee.com. The 26-year-old academic quarterly journal, The Concord Review, returns to print—thanks to new automated printing services. Oct. 1, 2013 - SUDBURY, Mass. -- The Concord Review is back in print. After publishing a printed edition for 23 years, this unique scholarly journal for the outstanding history essays of serious high school students was forced to go to online-only distribution three years ago. Thanks to new Print-on-Demand technology, the Review will offer subscribers physical copies again beginning with the Fall issue. The Concord Review is the only quarterly journal in the world to publish the academic research papers of secondary students. But the recession undercut much of the donor support that helped this 501 (c) 3 non-profit produce the 250-page journal, and in 2010 the decision was made to produce the Review in eBook form only. New Print-on-Demand (POD) services, which allow quick printing of small numbers of publications, enable The Concord Review (TCR) to print just those copies for which they have orders. This eliminates the need for production over-runs, warehouse costs, etc. Copies are shipped directly from the printer to the subscriber. Despite the huge popularity of eBooks and eMags, many institutions, like schools and libraries, still prefer the printed edition to circulate to their readers. History teachers use the essays in their classes. Authors featured in the Review purchase copies for themselves and prospective colleges, family members, etc. After leveraging eBooks to stay “in print” during the recession, POD is now reuniting TCR with a large part of their readership. Spurred on by these developments, TCR is now offering gift subscriptions. Many of their supporters have wanted to share the inspiring work in the Review with young scholars in their lives—like nieces, nephews and grandchildren. The gift subscription allows them to "sponsor" a young scholar, or even a whole high school class, by gifting a year of the Review, to show students the exemplary work of some of their peers. Many of their authors have sent reprints of their papers with their college application materials, and they have gone on Harvard (120), Oxford (13), Pennsylvania (23), Princeton (63), Stanford (38), Yale (98), and a number of other fine institutions, including Amherst, Berkeley, Bryn Mawr, Caltech, Cambridge, Chicago, McGill, Middlebury, MIT, Reed, Smith, Trinity, Tufts, Virginia, Wellesley, Wesleyan, and Williams. “The Concord Review provides a splendid forum for the best student work in history.” says Diane Ravitch, Senior Scholar at New York University. “It deserves the support of everyone in the country who cares about improving the study of history in the schools.” Other supporters include noted Historians Arthur Schlesinger and David McCollough, and Dean of Admissions at Harvard College, William Fitzsimmons. "We are fortunate that we have always had a large number of supporters who admire the work of our authors, and believe in our mission." said Fitzhugh. "Once again, we have a way to get the Review back in their hands. It's fantastic." We learned via a Facebook post that the American Antiquarian Society is now on Tumblr. Click this link and go directly to the AAS site. Enjoy! 1. When did you first become interested in history? Enrolling at Deerfield Academy, a private high school in western Massachusetts, and taking my first history course there piqued my interest in history. This class was one of the many Deerfield offered, and was entitled "The West in the Modern World." It surveyed European history from the Renaissance to current times. I had been a world traveler since I was young, hence the course material—peppered with primary sources—was not only captivating but also engaging. Deerfield’s Socratic pedagogy centering on class discussions honed my verbal and literary skills. In addition, my teacher Mr. Michael Silipo was at once knowledgeable and passionate, and over the course of a year patiently nudged the budding historian out of me. Deerfield developed my interest in history. 2. Which period of history currently interests you the most? Why? I particularly enjoy the post-World War II period, especially the Cold War between the U.S. and Soviet Union. Tracking the rapid technological and scientific progress of the late 20th Century fascinates me, from the first microchip to the spread of nuclear power, and how it interweaves with historical developments. My Concord Review paper on the link between the 1986 Chernobyl disaster—the product of a revolutionary nuclear generation—and the dissolution of the Soviet Union lies within the ambit of my interest. 3. What do you see yourself doing in the future? I see myself taking many more history courses prior to my graduation from Deerfield, especially those focusing on the West. Over the rest of my high school career, I aim to write more research papers and continue reading books outside of class to nurture this passion. I would like to major in both history and art history in college. I would then pursue graduate school and eventually become an academic. 4. Is there anything else you would like us to know? I would love to see more history classes offered at high schools nationwide and more of them allowing students to write long papers over the course of the academic year. I would like to thank The Concord Reviewand its founding editor Mr. Will Fitzhugh for giving high school students around the world—including myself—the only forum to have their history research papers published. The Concord Review enshrined my abilities in history, and I am incredibly honored to be a part of it. We've received word that the Gilder Lehrman Institute for American History is now accepting applications for its History Scholar Awards. Click here for FAQs. Fifteen top American history college seniors will be selected as Gilder Lehrman History Scholar Award winners. Go to this link for past winners. Click this link for program details. Spend a weekend in New York City, June 6–9, 2014. Participate in a program of special presentations, including meetings with eminent scholars. Experience exclusive behind-the-scenes tours of historic archives. Receive the Gilder Lehrman History Scholar Award at a celebratory dinner hosted by the Gilder Lehrman Institute in New York City.